Looking for some older CMFs (US). I'm seeking in priorities: S7 Bunny Suit Guy, S3 Gorilla Suit Guy, S14 Tiger Woman. Please be in good condition and comes with all the accessories. 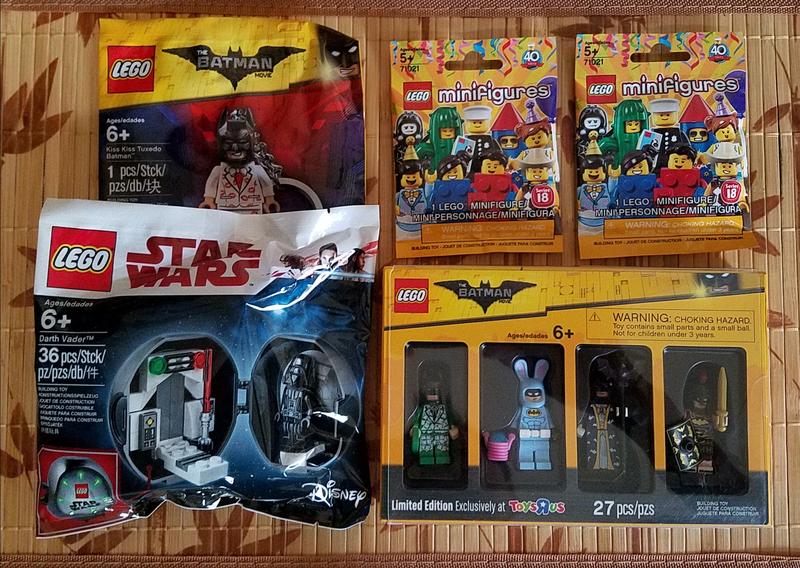 What I have is in the picture: 2 S18 Police Officers, Batman Bricktober, Darth Vader Pod. A FREE Kiss Kiss Batman keychain with every trade. Thanks. I've done a pair of trades with @ty8888 - excellent communication and the items were delivered quickly and packed well! Thanks @SumoLego for the endorsement. Wish I could help. Are you looking for anything else? I'm also looking for a S2 Mariachi Guy (with his accessories), S8 Santa, and The Lego Movie Series Taco Tuesday Guy also with his accessories. Please let me know. Thanks. @Muftak1 looking for Costume figures. Thanks anyways.